Whether you are shopping for an engagement for yourself or a ring to give to someone else, a rose gold engagement ring is a unique option that will stand out from the thousands of trendy white gold or platinum rings that are sold each year. There are not many women that want a ring that is exactly like someone else’s. Rose gold went through a very popular period at the turn of the century and is currently not a trendy option for engagement rings. If you want a high-quality and lovely ring that is unique like your love, rose gold may be the perfect ring option for you. Rose gold gets a rose colored hue from the higher percentage of copper mixed in with the gold. It has a warm hue that glows in many types of lighting making this type of gold highly prized. Rose gold comes in 14K or 18K gold. Pure yellow gold is 24K gold. Rose gold is a mix of yellow gold and copper. For example, an 18K rose gold piece of jewelry has 18 parts yellow gold to 6 parts copper. Rose gold is also referred to as pink gold and red gold by some retailers. Since rose gold jewelry was popular around the turn of the century and in following decades, antique rose gold rings that can still be purchased today. These are typically pricier than new pieces but come with a sense of history. Some families hand these rings down as heirlooms through the generations and they are given to a new couple who is about to wed. Many of these rings have designs that incorporate rose gold with a design in white or yellow gold. Many different stones could be set within the gold but diamonds are the most common for a classic engagement ring. A unique statement can be made by purchasing an antique rose gold ring paired with another stone, such as a ruby, which complements the warm hue of rose gold very nicely. These rings can often be found at estate sales, specialty antique jewelry stores, and online through sites like eBay. Before purchasing an antique ring from a private seller, you may want to ask them for referrals or check that they are in good standing as a seller. New rose gold engagement rings are also being designed in antique styles. These can be found online and in jewelry shops. These rings are typically on a scale that is larger and more ornate than today’s average plain Jane engagement ring. This can send a message about how unique you are, if you are selecting your own ring, or how special your fiancée is if you are shopping for her. Trinity rings are made up of white, yellow, and rose gold. The ring can be made up of separate bands that intertwine together to form a trinity symbol. Some rings do not have separate bands that intertwine but they often have a design that makes up a traditional Irish symbol of the Celtic Knot in the three types of gold. These rings traditionally represent love, loyalty, and friendship. A trinity ring is a very special engagement ring choice, with a lot of tradition and symbolism behind it. These can be found online and at retail locations, specialty Irish shops may carry the largest variety of rings. Depending on whether or not you are shopping for 14K or 18K gold rings, the price range is typically $500 to $2000 dollars for an engagement ring. The rings can also be purchased in matched his and her sets. In essence, this combines and engagement ring with a wedding ring and the bride and groom will wear rings with a matching design. Rose gold bands are typically sold at a lower cost than white or yellow gold bands. The pricing on these bands can run from $200 to $2000. A lot of this cost is decided by the size and thickness of the band. Whether or not the band has been engraved can affect the price, the more elaborate the engraving and design the higher the price. If you shop online for a rose gold band, you can save a significant amount of money compared to retail pricing. Searching for rose gold bands with the Google shopping search option will show you a variety of places these can be purchased from. Overstock.com is a favorite for deeply discounted engagement rings and they ship items out very quickly for a nominal shipping charge of $2.95. Sometimes the shipping charge is waived all together. Certain jewelry brands will drive the price of a band up, for example a Cartier rose gold wedding band will cost more than the high end price listed above for rose gold bands. Depending on whether or not a specific brand is important to you, discounts can still be found online for these designer brands. Engagement rings can be found made of rose gold inset with a variety of different stones. A classic rose gold engagement ring often has one centerpiece diamond or a design created from several diamonds. The price range on these types of rings will vary much more due to the quantity and quality of the diamonds on the ring. Pink and yellow diamonds are popular right now and can create a very classy look when paired with rose gold. An engagement ring is traditionally worn alone as a single band. Settings can also be purchased to add a wedding band that connects to the engagement ring after the wedding. The complimenting bands often match the design of the engagement ring. Some couples choose a plain rose gold wedding band to pair with the engagement ring instead. Rose gold engagement rings can also be found in a variety of other stones, rubies are a popular option as mentioned above. Rubies are available in a variety of color options but the classic, radiant, red ruby is thought to be a symbol of love and is a good choice for an engagement ring. Some beautiful rings are created with other precious and semi-precious stones as well. You can pair a rose gold engagement band with a stone, or even a few different stones, that have special meaning to you. An engagement band can be paired with a pearl or pearls. Pearls come in several types as well, so the final look will create a one of a kind ring. Pearls range in price depending on whether they were naturally created or were created in a lab. Some types of pearls are hard to find and are more expensive, such as black pearls. Pearls make a classic statement and compliment rose gold in this way. If some of the options listed so far are close but not what you are ultimately looking for, you can always work with a jeweler to design your own ring. The materials you pick will ultimately drive the cost of the final product. However, you can be sure that the engagement ring you create is a custom piece of jewelry and will be treasured for many years to come. It is also a very romantic idea and it is sure to delight the person receiving the ring. You may have a fairly complete picture of the ring you want to design but if not, jewelers will be more than happy to work with you on creating the ring of your dreams. A jeweler with a lot of experience can anticipate how the final product will turn out and can make suggestions to make sure the ring is comfortable to wear and will hold up when worn on a daily basis. To find a jeweler to work with, ask for referrals to jewelry designers at local jewelry shops and search for designers in your area online. Since this is an important action you are taking, it is a good idea to ask for referrals form past clients of theirs. You may also want to see past pieces they have designed or ask them if they have a portfolio you can see. Taste in jewelry is very personal and you might not end up with the product you want if your taste is completely different than the designer’s taste. You want to ask questions like how long should you expect it to take for the ring to be complete, how much they charge for their work, and what types of jewelry have they designed in the past. These are several ideas to get you started researching, searching for, and ultimately purchasing an engagement ring. Trust your own instinct for which rose gold engagement ring and style will be the right one for you. If you are planning to surprise your fiancée, it’s a good idea to look at jewelry she already has to try and figure out her taste. You can ask her friends or family for opinions as well on what she might like. If you have had discussions with her on what type of engagement ring she wants you may already have a pretty clear picture. Some women would rather not be surprised and give their input prior to the purchase of the ring; you can always propose and then involve her in the ring shopping. Doing research will help you find the best deal out there; you want to get the most ring possible for your money. She will be wearing this ring for many years to come so you want to put the time and effort into finding the perfect engagement ring. Hope you don’t mind me commenting on your subect page, but this is a subject close to my heart through industry relation. 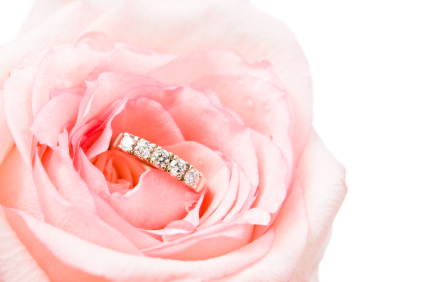 This year, we have found more brides looking for Rose Gold Weddng Bands than ever before, even taking over from Platinum which was one of last years highest ever recorded sales within the Wedding Ring industry. Personally, I prefer white gold especially when it is going with a white Wedding Dress, but everyone has their own taste and everything is equal when it comes to happiness. Great page, really enjoyed reading it, and will most probably keep an eye open for more content you post. It’s a great way of building search awareness by commenting on each others blog pages, so you must try mine one day! !